17' open utility boat with 1957 18 horse power outboard motor includes motor, gas can, fishing tackle box, fish landing net, oars, and fishing pole with reel. 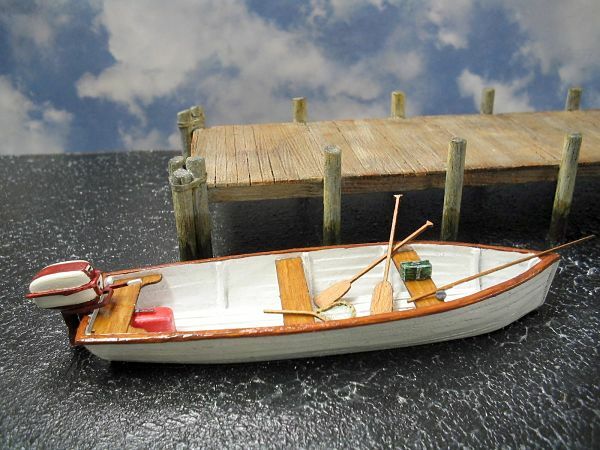 This boat will look great tied along side your dock or with your favorite fisherman out on the water, or pulled up on a beach or boatyard. Hull planking has detailed wood grain including nail holes and character cast in place. Builds into a beautifully detailed scene. The intricately detailed outboard motor may be built with the cover on or motor cover may be removed to display the beautifully detailed 2 cylinder engine. 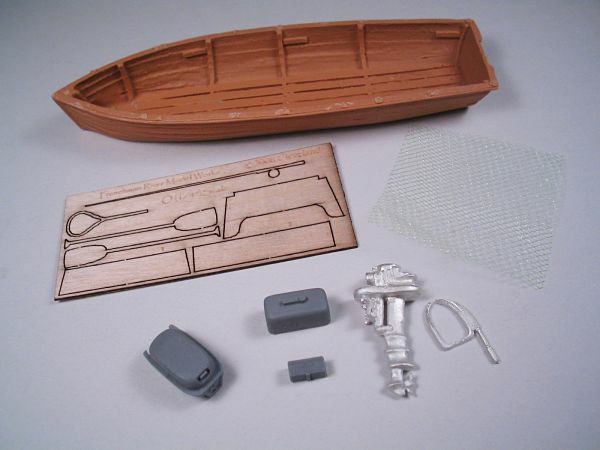 This kit contains high quality resin parts, detailed lead free pewter parts and laser cut details.